Scientists indicate that the sun is not to blame for the current global warming increase. Even if the weather down on Earth is becoming warmer, the sun did not cause it, specialists claim. Between 2001 and 2010, the temperatures were 0.2 degrees Celsius higher compared to the previous decade. Any knowledgeable scientist out there knows that humans represent a factor here, playing a decisive role when it comes to global warming. However, there are also other external factors which influence the climate of our planet, like the volcanic eruptions and the orbit of planet Earth. However, another question arises. What role does the sun play concerning the global warming problem? When peacefully contemplating the sunrise or the sunset we perceive this star that keeps us alive as being almost completely harmless. In fact, it is the other way around. It emits UV radiation, and its plasma injects gas into space. If you have forgotten about the solar winds, you should know that a wind of energetic particles constantly blows. This wind constitutes a tremendous hazard for the sensitive electronics in satellites. Furthermore, the radiant power of this massive star is subject to long-term fluctuations. The solar magnetic field determines these fluctuations. Its field lines are fused into the electrically conductive gas. Therefore, the plasma tubes are rotated and twisted due to strong turbulences. These tubes may occasionally snap and stir the magnetic field. These celestial activities lead to the formation of bright flares or dark spots. Dark spots are much cooler regions compared to bright flares that have fibrous-looking bright spots. They tend to be hotter than their surroundings. Furthermore, the number of flares or spots is not always the same, varying in an approximately 11-year cycle. Therefore, we infer that the total solar radiation intensity also fluctuates during this period. Scientists estimated these fluctuations at around 0.1%. The variations depend on wavelength due to the fact that the sun shines in distinct bands of the spectrum. For instance, the UV radiation may vary by several tens of percents in the short wavelengths. Due to its energy input, the sun can directly influence Earth’s climate. Nevertheless, the atmosphere surrounding our planet allows radiation to pass through particular wavelengths, mostly in visible light. Therefore, only a certain part of radiation actually reaches Earth’s surface, heating it up. In turn, the irradiated part emits infra-red light. Then, this is held back by aerosols and clouds. Without this effect, our planet would be 32 degrees Celsius colder. These processes indicate where the ultraviolet radiation plays its part. The UV radiation is involved in a wide range of other chemical reactions. For instance, radiation at wavelengths less than 240 nanometers triggers the development of ozone while a longer wavelength UV obliterates the same molecule. Besides the radiation at different wavelengths, distinct amounts of energy penetrate the troposphere, expanding to about 15 kilometers above the ground. 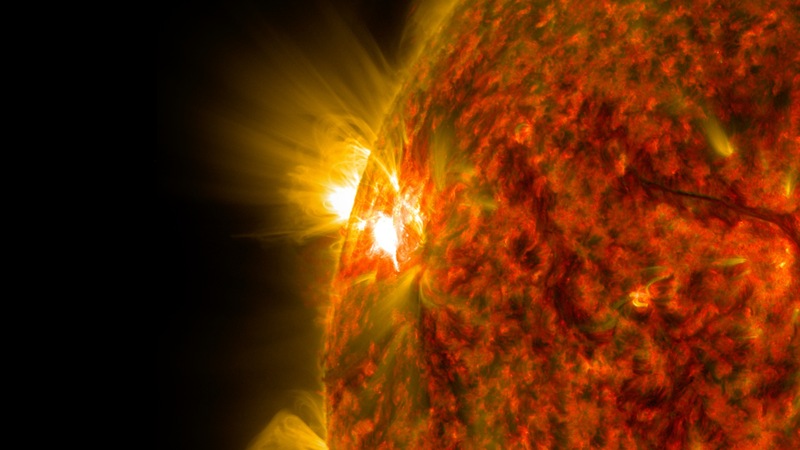 However, the sun does not only emit radiation, but also a flow of electrically-charged particles. When these particles get through the upper layer of our planet’s atmosphere, then they discharge electrons from nitrogen or oxygen atoms. This means that they ionize them. Furthermore, this complex process influences atmospheric chemistry. Specialists argue that how this influences the climate is still a matter of debate. Researchers decided to look to the past in order to analyze the influence of the sun on the climate of our planet. In this way, they managed to focus on the magnetic activity of the massive star. Therefore, they will use this data to reconstruct the radiation intensity. Apparently, the sun emits more intense radiation during its active periods compared to its quiescent phases. The current global warming increase is more likely to have been influenced by human-made activities. During the second half of the 17th century, the sun had a similar break in activity. Experts argue that between 1645 and 1715 its power started weakening. This period is also known as the Maunder Minimum. Researchers indicate that during this phase, Europe, China, and North America experienced much colder winters. Furthermore, even the summer season in those areas was substantially cooler during the Little Ice Age. Scientists used old records of observational sunspot data starting with 1610 and the C14 method. Specialists can apply this method to wood due to the fact that Carbon-14 input at the level of the trees is not constant. However, this also changes together with solar activity. The radioactive isotope forms when the cosmic rays reach an air molecule from the upper layers of our planet’s atmosphere. Then, the solar magnetic field expands throughout the solar system, partially screening off cosmic rays. When the magnetic field fluctuates, the production of C14 also changes. Therefore, the deviation between C14 age and tree ring age indicates a measure of magnetic activity and also for the radiant power of the sun. Over the past 100 years, our planet has warmed up with about 1 degree Celsius. During the last 30 years, the temperatures have increased at a fast rate. Furthermore, the carbon dioxide concentration raised by 30% since the middle of the 18th century. Specialists claim that during this period our sun had been subject to regular activity fluctuations. However, they did not register an increase in the sun’s brightness over the last 40 years. Therefore, all these facts indicate that the sun could not have contributed to global warming. Furthermore, if scientists were to take into account only the influence of the sun, they argued that they cannot reproduce into models the the temperature increase from the last decades. Scientists will agree with the observational data only when the human-driven factors will also be included. Therefore, the increase in global temperatures registered starting with the 1970s is not due to the sun’s actions. This trend of temperatures observed by specialists is linear over the past three decades. Specialists indicate that the human influence on climate change is much bigger than that of the sun. Therefore, the current global warming increase from the last 30 years appears to be the effect of human-made practices that damaged the environment. Unfortunately, global warming continues to affect thousands of creatures, devastating their habitats.